Kai Yaang (Whole Bird): Roasted natural game hen rubbed with lemongrass, garlic, pepper and cilantro served with a spicy sweet and sour dipping sauce. Muu Sateh: Carlton Farms pork loin skewers marinated in coconut milk and turmeric, grilled over charcoal and served with peanut sauce, cucumber relish and grilled bread. Yes, bread really is the normal accompaniment. Phat Phak Ruam Mit: Stir fried mixed vegetables and wild caught prawns with garlic, fish sauce and oyster sauce. Not all Thai food is spicy. Khao Soi Kai: Northern Thai mild curry noodle soup made with our secret curry paste recipe, natural chicken on the bone and house-pressed fresh coconut milk. Served with pickled mustard greens, shallots, crispy yellow noodles and roasted chili paste. Chiang Mai specialty, with Burmese origins. 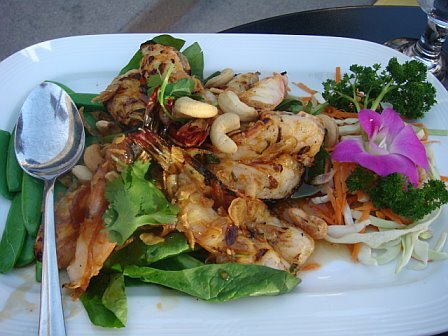 Ike’s Vietnamese Fish Sauce Wings: Fresh natural chicken wings marinated in fish sauce, garlic and sugar, deep fried, tossed in caramelized Phu Quoc fish sauce and garlic and served with Vietnamese table salad. Our daytime grill cook Ich Truong’s recipe from his home in Vietnam. Amarin has been voted the Best Thai Restaurant in Mountain View for the past five (or so) consecutive years so we took a table on the sidewalk and ate here. 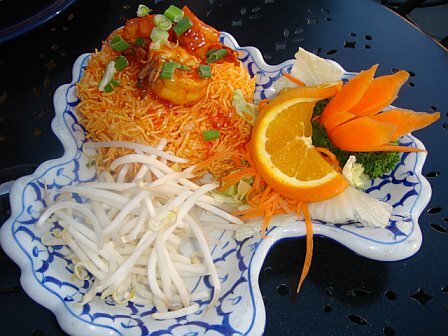 I chose the Thai crispy noodles (mee-grob) because they sounded interesting and I had never had anything like them. They were tossed with sweet and sour sauce and served with shrimp and tofu. They were so good and really filling for an appetizer! 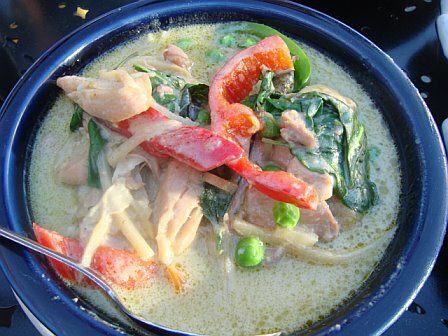 We went with chicken green curry with sticky rice. It had a nice kick to it but wasn’t too spicy. Boyfriend’s excellent choice was the Tamarind prawns with snap peas and cashews. They tasted like they had just come off the grill. The only downside was that they were incredibly difficult to peel off from the shell. I loved Castro St. and the neighborhood around it. 🙂 Boyfriend really liked this restaurant and I have a feeling we’ll be back again in the future.